After firing off a couple singles earlier this month, rapper Boosie Badazz (formerly Lil Boosie) has revealed more concrete details behind his first post-prison LP, Touch Down 2 Cause Hell. Namely, he's offered up the cover art and a loose February 2015 arrival time. Boosie sent out the artwork online today (November 19) through his Tumblr page. As you can see up above, it's a fairly solemn shot of the ice-adorned rapper staring straight into the camera's eye. While so far the record has not been given an official due date, it's expected to land in February. 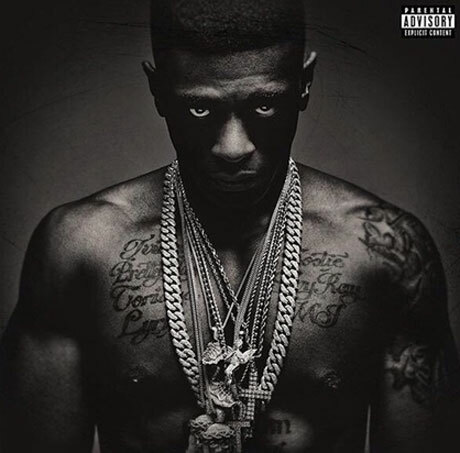 Though a tracklisting has yet to be unveiled, the album is said to feature Boosie's recently revealed "Like a Man" track with Rich Homie Quan, as well as the Webbie-assisted "On That Level." A documentary looking at the rapper's five-year incarceration stemming from pleading guilty to third degree drug charges, as well as the details surrounding his not-guilty charge on first degree murder charges, is also on the way. The film is also called Touch Down 2 Cause Hell, and you can watch a trailer for the project down below.